It will not just be what you taste so much as it will be where you taste it. 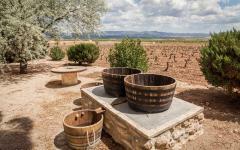 Sparkling Cava while gazing over Penedes vines, Rioja Gran Reserva in a Laguardia cellar, exclusive Priorat wine at a hillside farmhouse and the arid beauty of Ribero del Duero are all yours to enjoy. 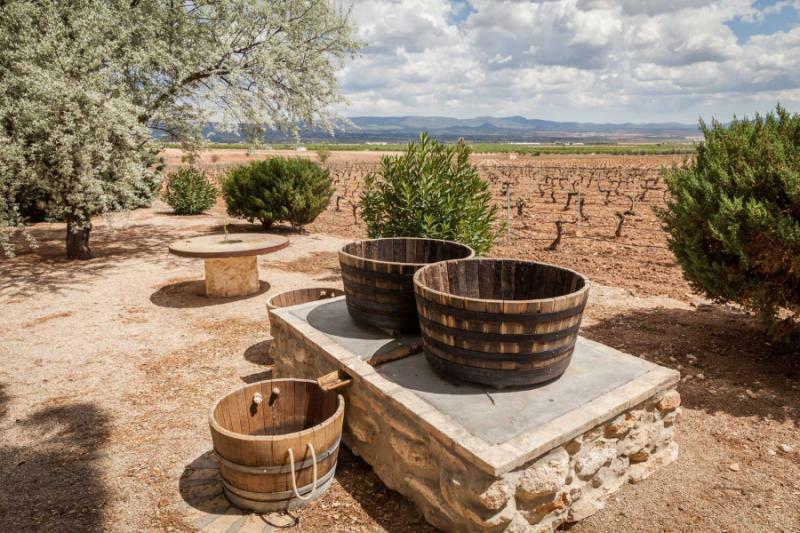 Handcrafted to explore Spain’s most important wine regions, this relaxed 10-day tour covers the places and people that define the wine. Three nights in Barcelona for Penedes and Priorat, two nights in Ribero del Duero, three in La Rioja, and then Madrid. 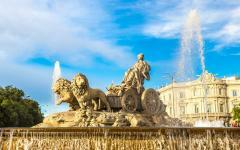 Enjoy a vacation in style by seeing the other Spain vacation packages we offer on Zicasso. 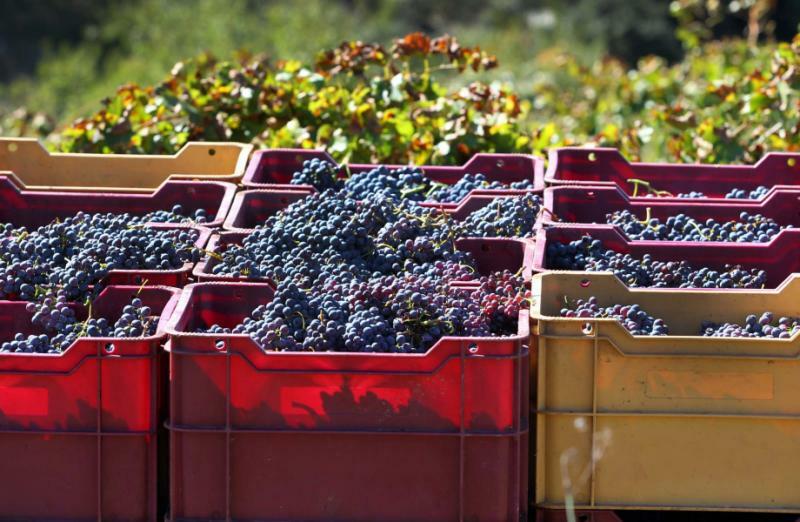 At first, Spanish wine dazzles with its diversity. While the grapes being used are relatively standard across the country, a Priorat is quite different from a Toro. When you explore more, there are more subtle differences, like when La Rioja and Ribero del Duero are compared through multiple vintages. Tempranillo is the dominant grape, but the cultivation methods contrast across the Spanish DO (denominacion de origen) regions. And like all good wine countries, it is the diversity of terroir that proves most memorable. This handcrafted tour visits Spain’s most important wine regions and has you tasting the differences. By connecting you to people and places, it helps you really understand Spanish wine, with the story told by those that define it. Visit Spain, and you can visit vineyards, perhaps do a tasting, and certainly try wines in the bars. This tour is packed with private appointments at places normally closed to the public. You will taste with the winemakers and cellar-masters, and then tour the vineyards to see how and why the wine turns out differently. Unlike the bars, you will get to taste multiple vintages as winemakers dust off bottles from the cellar to open. Where you get to taste will also be memorable, be it the steep terraced hills of Priorat, the lush landscapes of Penedes, or the rustic charm of Ribero del Duero. There are four overnight destinations, and most of your days are spent in wine country, stopping in villages and vineyards. You will stay in cities and towns, so there is plenty to see and do beyond just the wine. 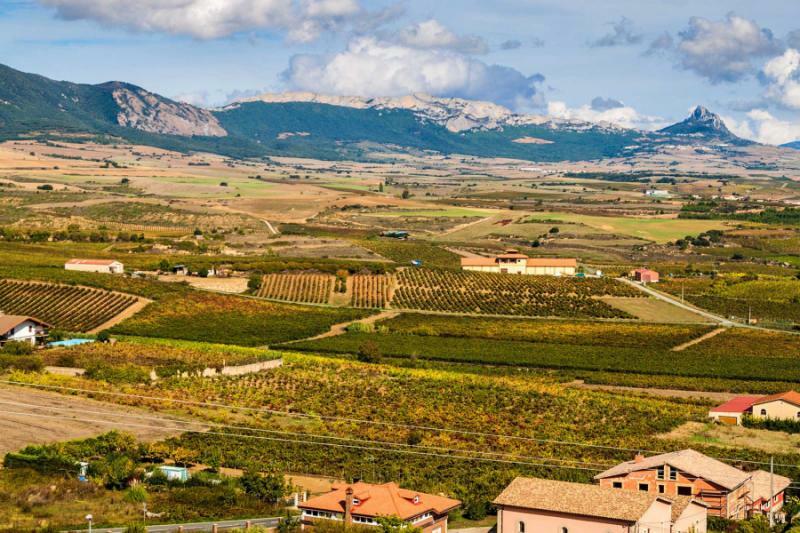 Although Spain has 11 DO regions and two DOCa regions, the highest category under Spanish wine regulations, this tour focuses on the most important while also a providing chance to explore upcoming, new-world-style wines as well. 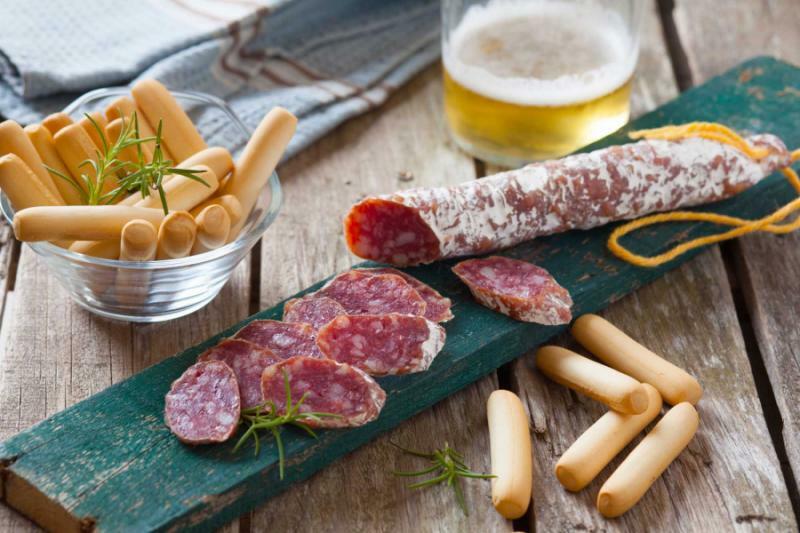 There will also be plenty of food en route with each region showcasing their culinary specialties, found everywhere from pintxos bars to fine-dining restaurants. Base yourself in Barcelona for the first three nights, a vibrant city with all manner of world-class monuments to check out. Spend the first evening with your guide in Bari Gotic to explore the wine bars and tune your palette to the different regions. On day two, you will explore the heart of Penedes where crisp, sparkling wines are a good palette cleanser for the heavier reds that will come. Sample the aromatic Cava whites while looking over the vines, enjoy a Cava and food pairing, and then weave back to Barcelona, perhaps with a stop in Sitges. 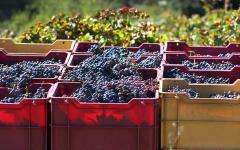 Priorat is a DOCa region and the focus of day three, producing fine exclusive red wines that demand good cellaring. They are boutique wines that can be hard to find outside Spain, so indulge at two wineries. Fly to Burgos, a beautiful medieval city with a cathedral you won’t quite believe. 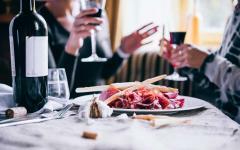 Now you will be into the velvety Tempranillo wines that are synonymous with Spain, the Ribero del Duero the region now rivaling La Rioja as the rumors continue that it will soon receive DOC status. With two days at your disposal, you can relax and really get to know the medieval city, as well as visit four to five different wineries. Next, it will be La Rioja, and you will descend into Laguardia’s aromatic wine cellars and feast on an atmosphere where everything revolves around wine. You cannot rush things in La Rioja because nothing really happens to speed time, your languid morning giving way to lunchtime wine and then more wine. On the next two days, you will visit a selection of vineyards ranging from world-famous producers to small farms that preserve handpicked and handcrafted methods. 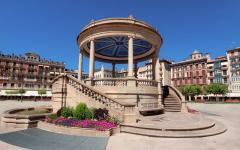 The next day, you will head to Pamplona, an old city of towering walls and cute squares. 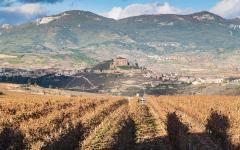 The city is famous for the Running of the Bulls and in the heart of the Navarre Valley, where experimental vineyards and part of a wave of new-world wine in old-world wine country. End your trip in Madrid, where sightseeing meets with decorous wine bars, and you can taste those regions that have not been featured thus far – Toro is just one to watch out for. 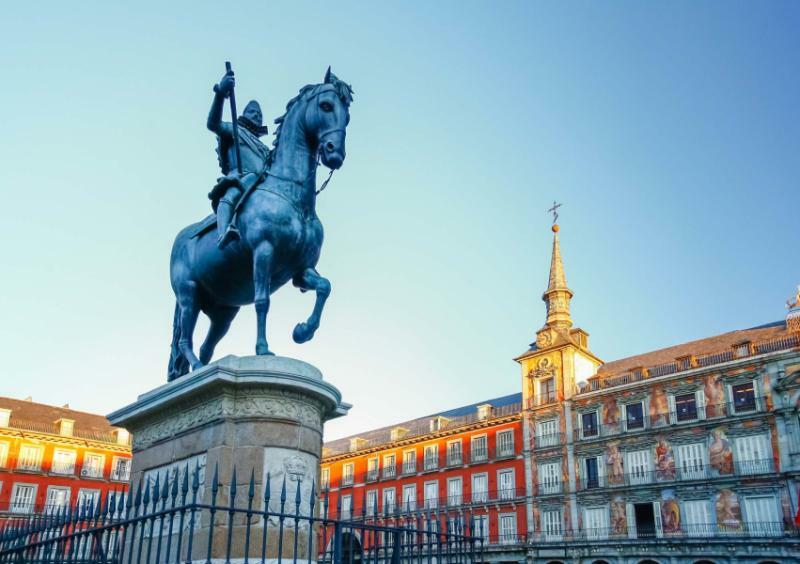 Being the capital city, Madrid also provides good flight connections as your ten days with Spanish wine comes to an end. Throughout the tour, guides will assist in shipping your purchases back home. 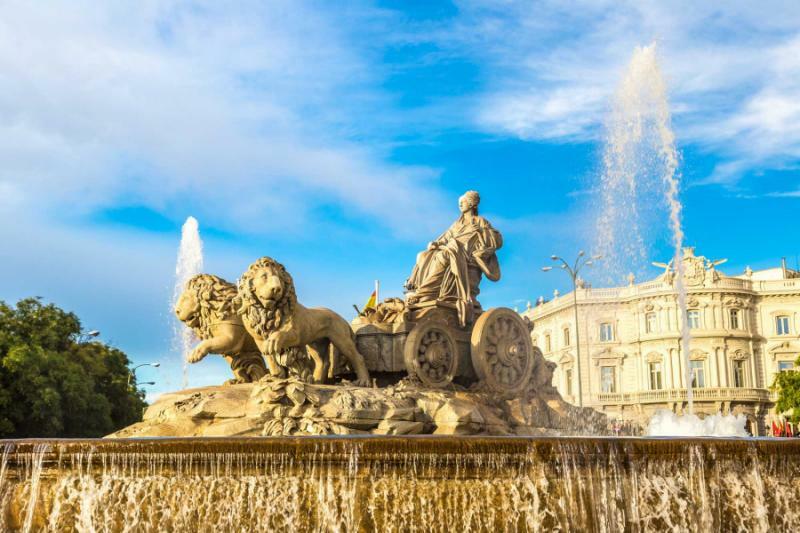 Spain is a region unlike any other; learn more by seeing how our partner Spain tour operators can personalize the experience for you. Barcelona has an alluring atmosphere, even during the winter. You can sense that this is a city where people enjoy life and live it to its fullest. Touch down and transfer to Barri Gotic, a central pedestrianized area dotted with Roman remains and Gothic architecture. Out on the streets, you will feel the energy and the vibrancy of a bustling, coastal city. You will find wine bars tucked into millennia-old churches, plus boutique wine terraces for watching the people walk by. 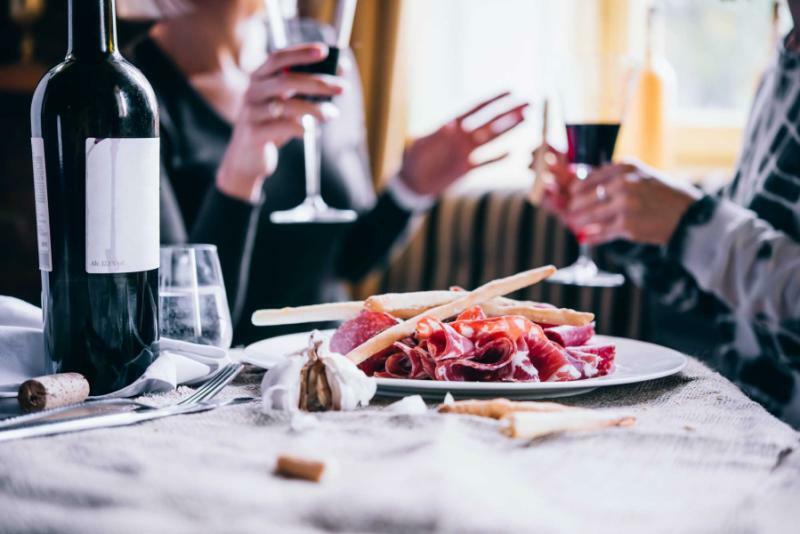 It will be at these wine bars where you start your exploration, your guide helping you get an overview of Spanish wine region styles, helping you get a feel of varietals and vintages. Lemony flavors roll around the tongue as the first bottle of brut Cava is opened. Cava is predominantly produced from the Macabeu grape and then enhanced with the rich floral pear and melon notes of Xarel-lo, with its zesty citrus and acidity coming from Paralleda. These three Catalan grapes produce a sparkling wine that many now prefer to Champagne. It is not quite as nutty as its French rival, but very balanced and around 6-12 grams per liter of residual sugar, while extra brut Cava has less than six. You will be learning the subtleties of all this at a vineyard in Penedes, where the vines flow towards the Mediterranean, and you can feel the soft salty breeze. Move onto a second winery for your tour of the vines to see how each varietal benefits from a slightly different location with the three grapes layered on different parts of the hill. At this winery, you will taste with lunch, the soft delicate flavors best complemented by Penedes Cava. Although they do produce Cava elsewhere in Spain, 95% of the country’s sparkling wine comes from here. So keep tasting, an afternoon stop helping you appreciate the Vintage Cava that has been aged on the lees, giving it a rich apple and almond flavor. You will probably be a bit light-headed after all the bubbles, so time back in Barcelona will be on order with many charming streets to go explore. Hidden in Catalonia is a valley of steep hills, dominated by vineyard terraces. Production is mostly by hand here, with many of the slopes too steep for large farming vehicles. The views are always sublime and the roads are slow and winding. Welcome to Priorat, the grand dame of Spanish wine regions, where the dusty red wines are packed with complexity. Priorat is one of only two Spanish DOCa regions, Rioja is the other, and the wines really need food. Licorice and black cherry notes stand out on these Grenache and Carignan blends, perhaps a hint of plum or dark chocolate dependent on the bottle. They are full-bodied red wines, high in tannins with superb cellaring potential, and most are held back at least five years from vintage. Spend the whole day in Priorat, first stopping at a small village to try some olive oil, and then heading to a Priorat vineyard for the complete tour followed by lunch. The winemaker opens some old vintages, so you can experience how these wines change with age. There’s another winery stop later in the afternoon, another chance to buy wines that rarely make it outside Spain. This morning is left free so that you can see more of Barcelona, perhaps visiting La Sagrada Familia or Palau de la Musica Catalana. Fly direct to Burgos in the afternoon and take a private walking tour through the medieval city. Rugged sandstone buildings show their age proudly, not quite in ruin yet not as polished up as in some cities. This is a city you must walk and with three hours you can explore all of the major monuments. One of the medieval walls has been converted into a boutique wine bar, where you can spend the evening eating tapas while tasting Ribero del Duero wines. La Rioja was always the darling of Spanish red wine. It has the DOCa status, but actuall had its own regulations long before a nationwide system was introduced. Yet in the last 20 years, La Rioja has seen its dominance eaten into by Ribero del Duero. The regions are neighbors, and the production is very similar, both mostly using Tempranillo dashed with a little Garnacha (Grenache). It’s the terroir that makes the difference, and many now consider Ribero del Duero worthy of DOCa status. These wines have the structure and tannins of a Cabernet Sauvignon, yet an indulgent fruitiness that can handle the oak aging. It is hard to know which of the two regions you will prefer. But over this and the next two days, you will have an abundance of choice for forming an opinion. Spend today in rural wine country, visiting three different vineyards. A winemaker guides you around one, proudly showing off how the farm has developed in just 30 years. 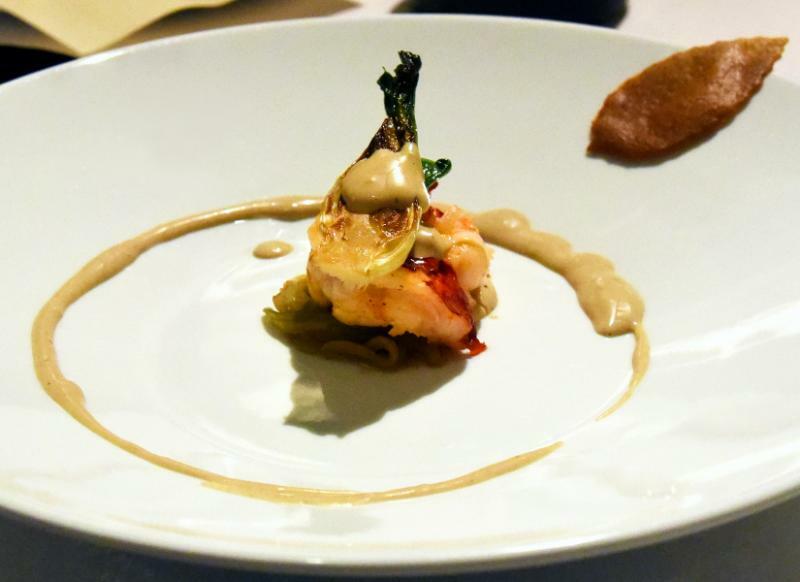 At another, you will be tasting over a century of history. Then in a 12th-century monastery of Abadia Retuerta, you can taste more of what has recently been voted the best red wine in the world. Cathedral chimes guide you back to Burgos, where the guide can assist in choosing a restaurant for dinner. 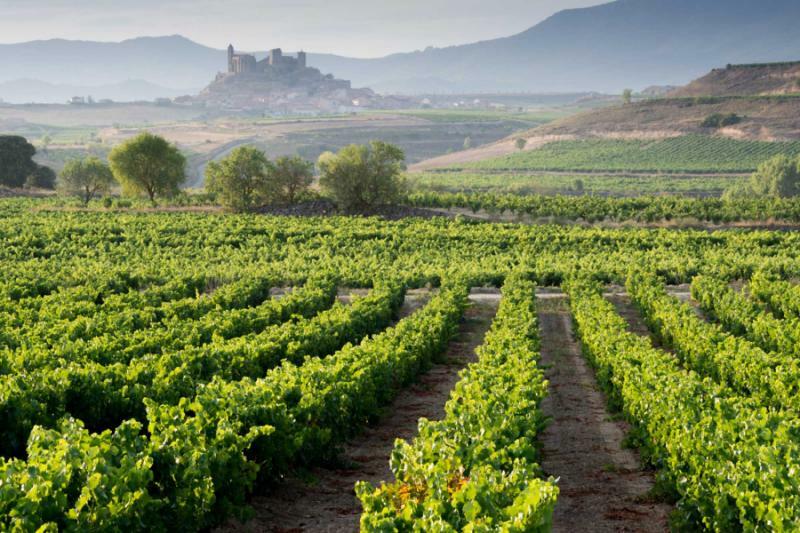 Rioja is one of those names that excites all wine lovers. It seems to be a region in continual bloom, the slopes carpeted with Tempranillo and Garnachea vines. Vineyards seem to be everywhere, row after row of grapes surrounding whitewashed bodegas and tiny church-dominated villages. Stop first at an ultramodern winery, learning the different processes for crianza, reserva and gran reserva wines, then seeing how a major exporter processes great quantities of wine. Then head to an aging farmhouse, where tradition has been preserved, and the cellar-master provides plenty of options to go with your organic lunch. By exploring the wineries, you will have an idea of the terroir and conditions that produce these wines. Then, by exploring Laguardia, you can find the long-standing tradition that delights every wine lover. Wine is more like a religion in this soporific region, but they are not too pretentious about it, especially not underground, where a mazy cellar stretches through the town. Townhouses and restaurants provide access to these musty interconnected cellars, and you go exploring, the smells as memorable as what you get to see. Tasting in the Laguardia cellar is an iconic experience and brings today’s La Rioja tasting to a close. But should you wish to continue there are many wine bars along the cobbled streets. 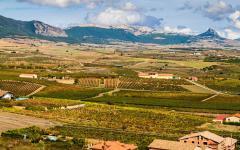 Another day in La Rioja and you will do as the locals do and try different wines. Finca Valpiedra is a lovely stop, great for the views and some classic wines. Remirez de Ganuza brings some new flavor to the palette, particularly an experimental use of Graciano and Mazuelo blended with Tempranillo. 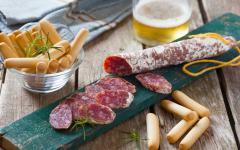 In the evocative little town of San Vicente de la Sonsierra you will dine on Rioja’s trademark food. Then back in Laguardia, you can take a lantern down into the cellars. Your guide will produce a key to this underground world, and you can walk in what must be the world’s largest interconnected wine cellar. Musty scents are not as vivid as yesterday, with much of the cellar now empty of barrels as most wineries now have storehouses more conducive to modern transport methods. The beauty of where you are remains, and the iconicity of the wine continues late into the evening. 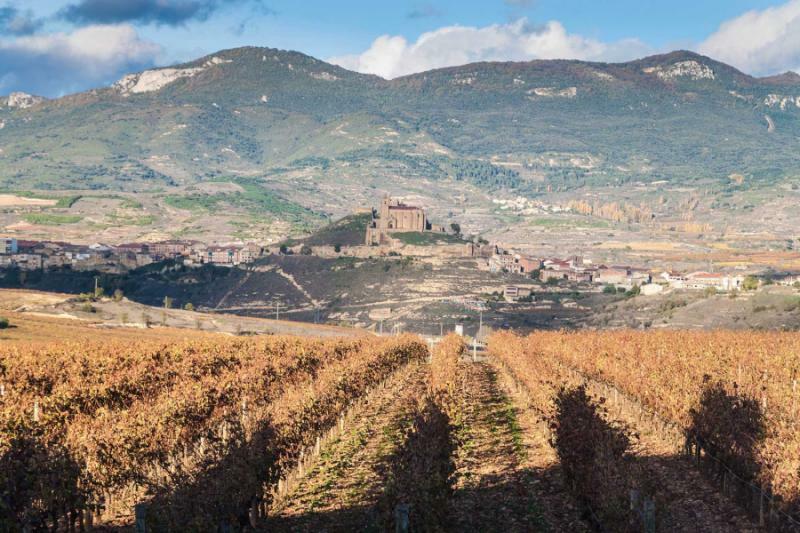 Halfway between a Bordeaux and a Rioja would be Navarre, where the sun-drenched valleys are finally gaining a recognition they deserve. Garnacha dominates here, creating a light-bodied picnic style of red wine, floral on the nose with a spicy, berry finish on the palette. After your last three days, this softer style may come as a surprise, perhaps also some respite from the high tannins. It will be best accompanied by some Navarre food, with plenty of cured hams and soft cheeses on the lunch menu, along with the regional specialty, suckling pig. Visiting three wineries you will taste two very different styles of Navarre wine. There is the soft, subtle picnic wine, easy to drink and light on oak, more a rose than a red. Then there are the new pioneers, those helping to transform Navarre’s wine image into something more serious. 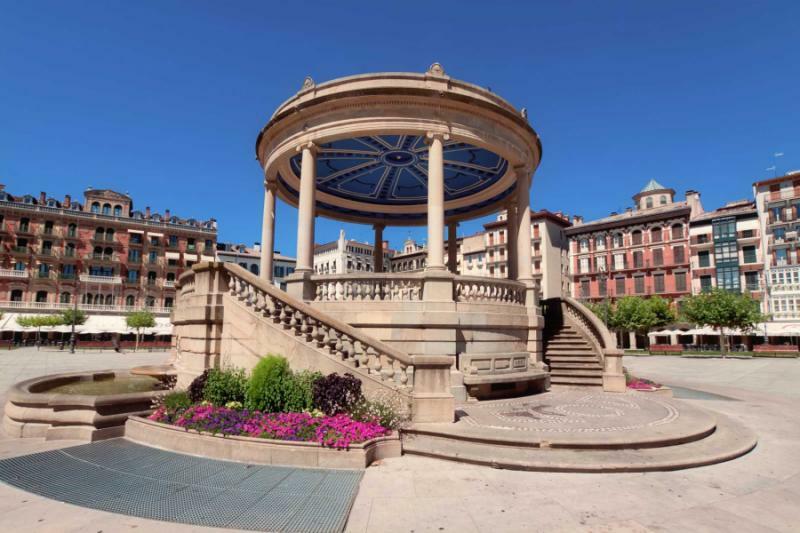 With a full day in the valley, you can also visit Olite, where a magical castle looks out across the plains, and then Pamplona, a city famous for the Running of the Bulls that has got far more to offer than a once a year festival. As with all the days the pace is flexible, and you can add or subtract from the itinerary as you go. The guide ensures you will not miss Pamplona’s tiny cobbled streets, where it seems every building has an outdoor wine terrace. 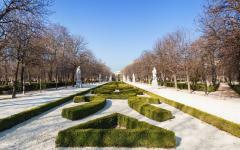 From La Rioja, you will travel to Madrid and spend a free day in the capital city. The Prado awaits, as does a stunning royal palace and the world’s most famous chocolate and churros. This evening you can follow in the footsteps of Cervantes through Madrid’s oldest quarters, stopping in three tapas wine bars. Now you will get to taste the other regions, such as the zesty white wines from Galicia, bold and powerful Toro, and Muscat from the volcanic Canary Islands. 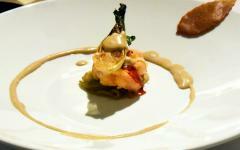 The food is equally eclectic, Madrid being a hub for traditional flavors from Andalusia to Basque. 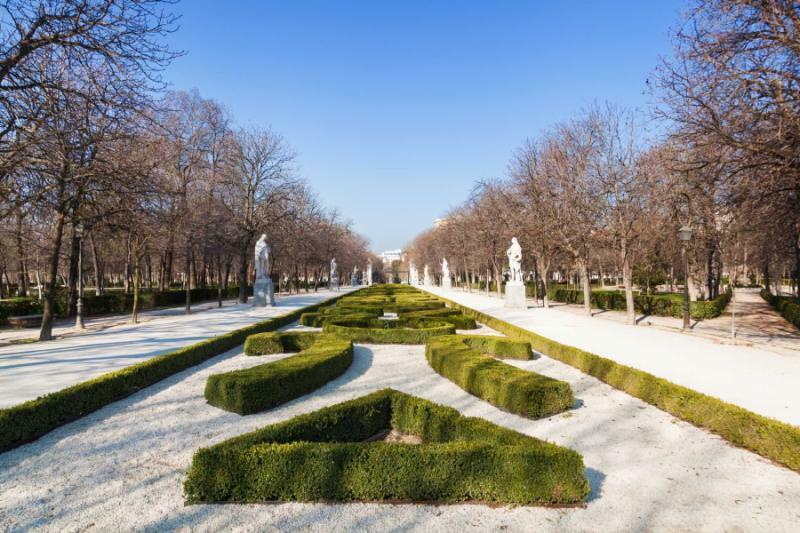 Spend the day discovering more of Madrid before your private airport transfer brings your tour to a close. Guides will have assisted you with shipping throughout the ten days, so you have many years of Spanish wine to enjoy once back home.